It was a roasting hot day for the Tour de Yorkshire so I was worried about sunburn. Of course, being a computer programmer and being from Yorkshire, I’m worried about sunburn pretty much all of the time. I started with some factor 50 and then re-applied a special factor 30 “sport” edition at each feed station. The sport edition is more resistant to sweat than normal suncream. It feels more like you’re spreading an ointment than some cream. For the most part, it worked. The only problem was there was a slight gap between where my suncream came up to and where my cycling shorts came down to. I’m not sure if I didn’t cream high enough or whether my shorts rode up a little bit during the ride. 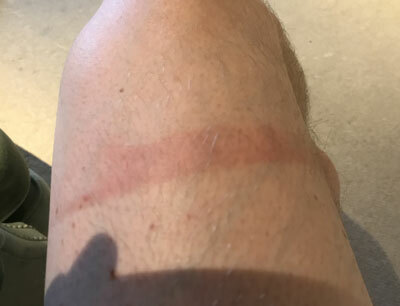 But, either way, I’ve got these little strips of sunburn that have been hanging around on my legs all week. Still, at least it was nowhere near as bad as Iceland. This entry was posted on Monday, May 14th, 2018 at 11:00 am and is filed under Life. You can follow any responses to this entry through the RSS 2.0 feed. Both comments and pings are currently closed.